Yesterday we moved off Skomer for the winter. We were looking forward to getting off, to seeing friends, having a change of scenery and generally taking a break. But of course we were also sad to leave and it seemed that the wildlife was trying its best to convince us to stay. On Tuesday another adorable seal pup was born on South Haven beach and it really wanted to be monitored, so its sad that we won't follow its progress. …and even the voles joined in the conspiracy to entice us to stay: One came out from under a sheet of corrugated iron and was nibbling on plants in such a charming way that we nearly forgot to finish tidying up around the house. And then of course there was Jack, our semi-tame Jackdaw who didn’t want us to leave. He had been absent for nearly a month but two weeks ago he turned up again, strutting around on our balcony, demanding food with a sorrowful “fud” noise. But beware, once you had fed him he would eye the food suspiciously and if it wasn’t to his liking (he did not eat pumpkin seeds for example) he would look at you in a very reproachful way. …and two Robins had taken residence inside the hostel and tried to prevent us shutting the windows and locking up. 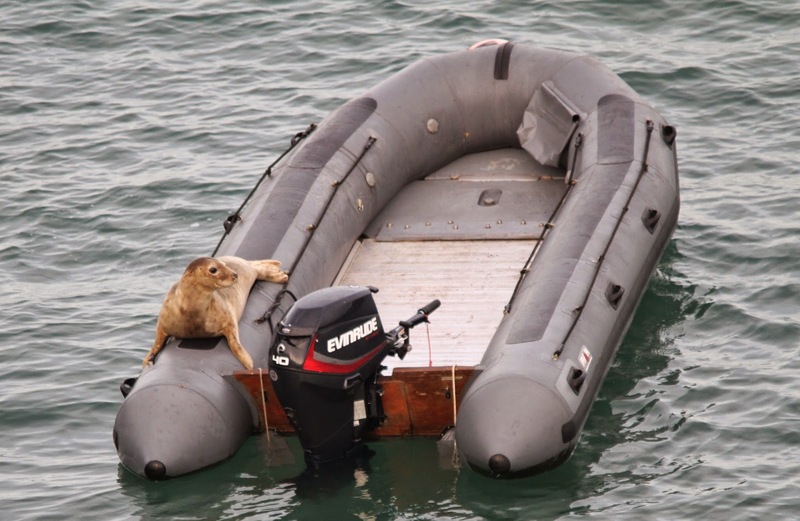 However when all of these attempts to ensnare us on Skomer had failed the wildlife cranked it up a notch: They sent in their bravest agent to highjack our boat. None the less we made it safely to the mainland and are now going to spend some time writing reports and organising next season before we are off on “holiday” (we are joining a Wader ringing expedition) to Australia in February next year. Sunny spells have been a rare treat in the last two months but this week we had several nice evenings. On one of these I went to the Amos and to the Wick to check for seal pups. I didn't find the pup at the Amos, maybe it was hiding, but I was greeted by a great number of Fulmars. This year we had 41 pairs of Fulmars breeding in the Basin (opposite the Amos) and they always seem to enjoy soaring around the cliffs, but on that evening they appeared to be more playful and adventurous than I had ever experienced. I was sitting on the cliff edge and the Fulmars were flying really close infront of me, above me and below me - some came shooting down from behind so that I ducked because I thought they would land on my head. I think they were just as curious as I was and wanted to have a good look at me. These Fulmar pictures were taken without any zoom! Whilst I had fun with the Fulmars, Ed had gone onto the Neck to check these beaches for seal pups. 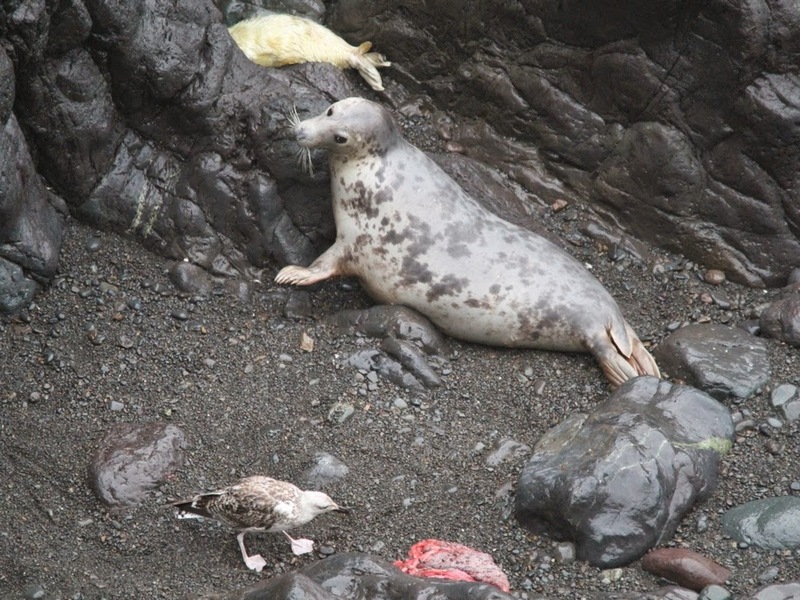 At Castle Bay he came across a female which had just given birth. 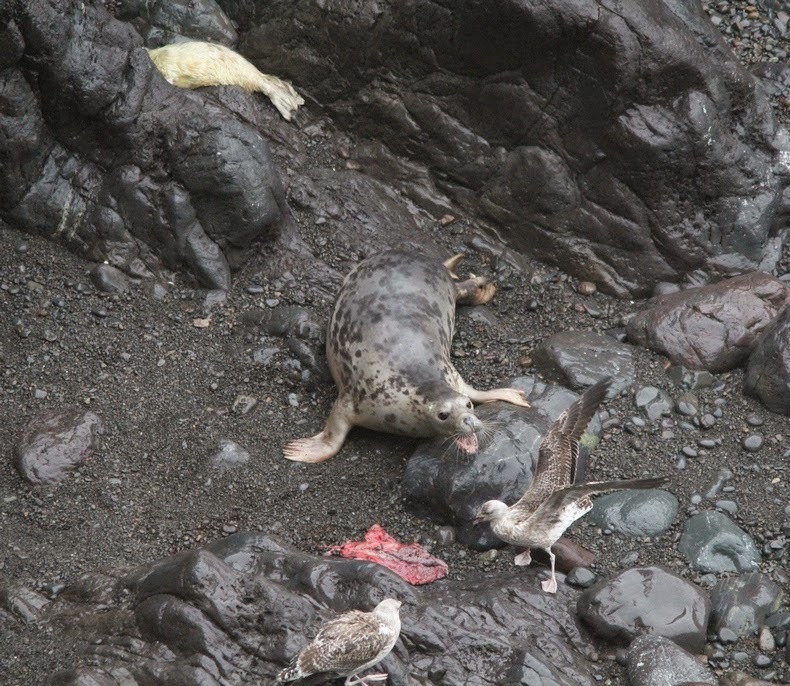 The afterbirth was lying next to her and of course it had attracted gulls. 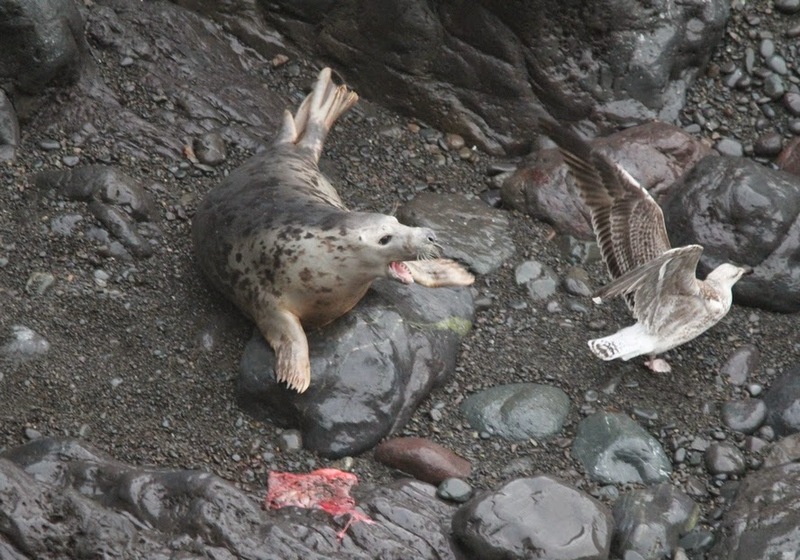 Although the gulls were not interested in her pup they seemed to annoy the female enormously. It was rather funny to watch her chase off the birds. The first is one of what have been called the 'striped sprites'. This Yellow-browed Warbler comes from the Siberian Taiga and has six stripes - two wing bars on each wing and a stripe above each eye. A Pallas's Warbler has all of these plus a stripe along its crown. As well as looking pretty cool these stripes break up the outline of the bird and provide it with the perfect camouflage for life in the forest. Next is a Peregrine Falcon which is hidden by the shear number of its prey. 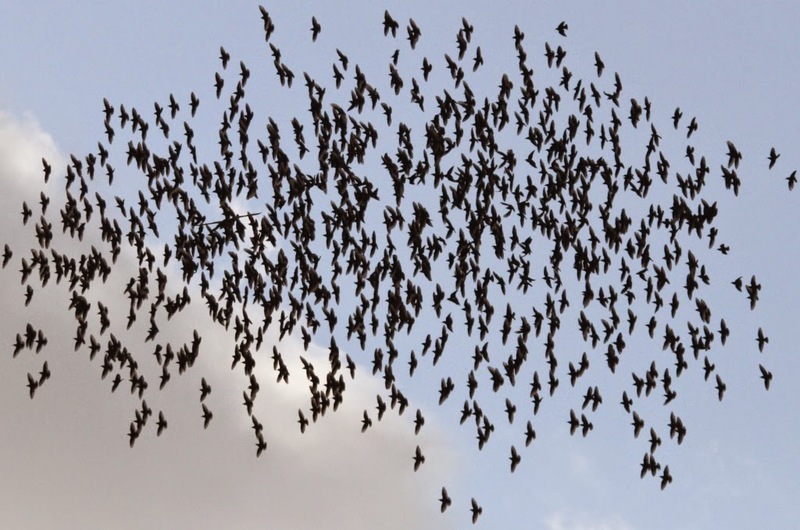 The chances of a starling being taken by a bird of prey from a flock of 10 are 10% and only 1% from a flock of 100. So each bird in this flock of roughly 600 has only 0.17% chance of being taken by the Peregrine. No sweat! Peregrine falcon, the fastest animal in the world can still only take one bird at a time, although there were three Peregrines hunting starlings that morning!! What are there chances now? Last one and probably the hardest of them all. These two little seals are almost completely lost on this boulder beach. 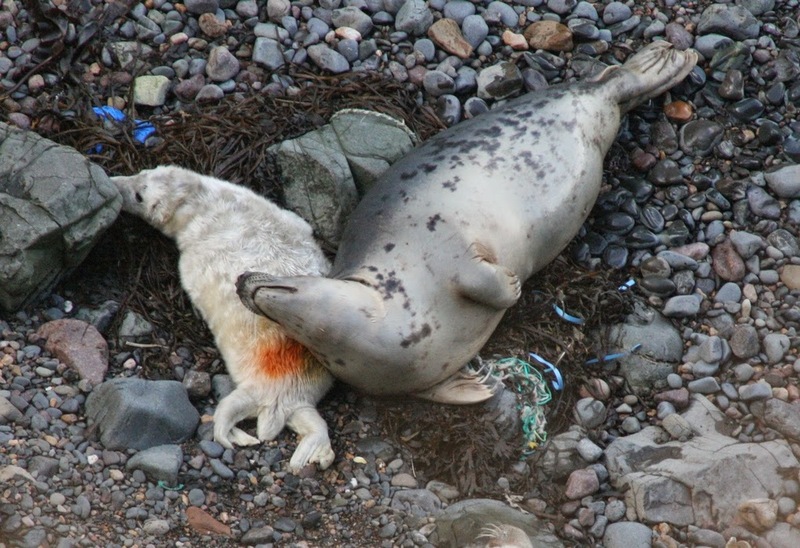 Our Grey Seals give birth to a single white coated pup in autumn. After three weeks of suckling on some very fat rich milk the white coat is moulted off and they are weaned. Their first adult coat is much better camouflage and makes our job of studying the seals much harder. As it is getting (very) late in the season and the days are getting shorter we have set you a little spot the bird (and seal) quiz to pass the (our) time. Have a careful look at these three images. The first one has a single extremely well camouflaged bird in it. In the second you are looking for the predator amongst the prey and in the third are not one but two seals. Can you pinpoint all of our wildlife 'wallies'? Check out the blog on Monday to find out if you were successful. 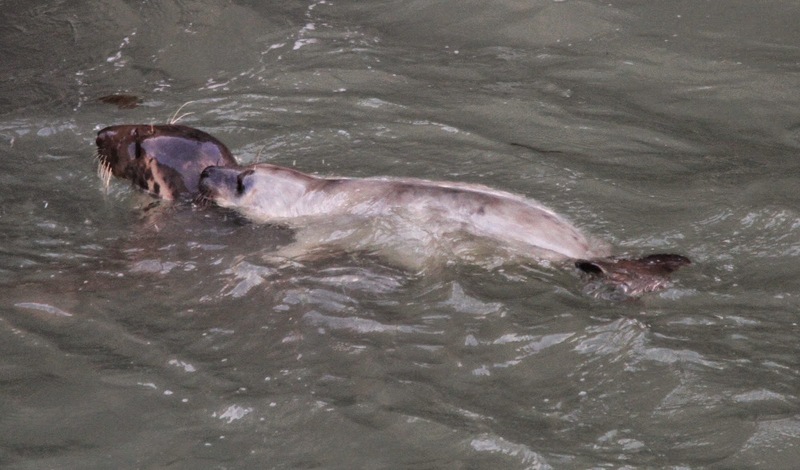 I know we should not anthropomorphise but sometimes it is really difficult not to see human behavior in seals. 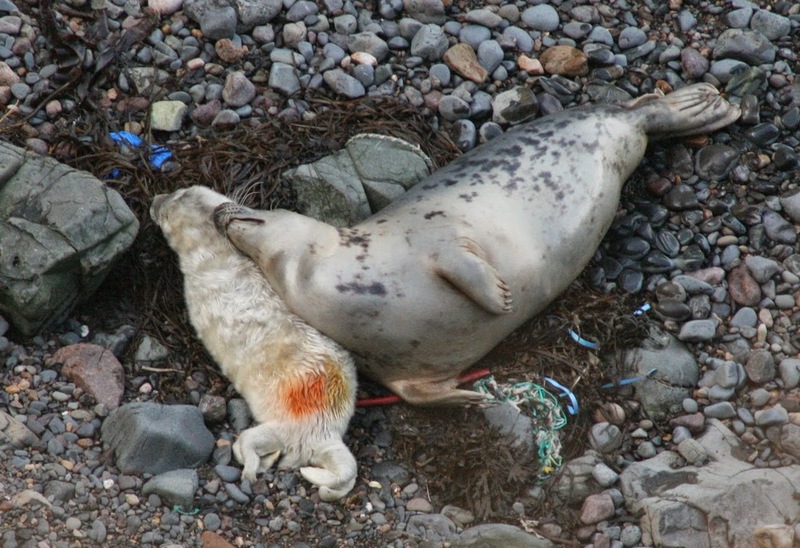 Have a look at these pictures and then tell me that this mother and pup are not fond of each other. And then I had a laugh when I saw this little fellow: This pup used to be white but it had been laying in a pile of clay at the bottom of the cliff. You can see its trail all the way across the beach. We sometimes call the seals "slugs" when they lie lazily on the beach all sprawled out but this pup has given our nick name a whole new meaning.